Our Stainless Steel Buttweld Pipe Fittings are highly demanded in the market because of their sturdy construction, anti-abrasive property, corrosion resistant, durability and fine finishing. We have carved a niche as a prominent Manufacturer, Exporter and Supplier of SS Buttweld Pipe Fittings. We are offering huge assortment of SS Buttweld Fittings which are available in different sizes, grades and specifications. 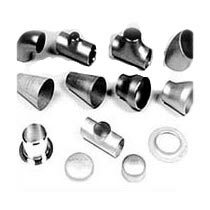 These pipe fittings are delivered in high-grade packaging material that restricts these fittings from any kind of damage. Standards available : ASTM / ASME A/SA 403 GR WP "S" "W" " WX"